HDR, or high dynamic range, has been around for a while, and you’ve probably heard countless barks from your console box friends about how amazing that new Dad of War looks on their giant OLED telly, or how they can never go back to a ‘normal’ screen after experiencing the wondrous glory of Final Fantasy Toast (even we’re a bit guilty of that last one, Alec and I, so please accept our belated apologies for all our Ignis-related food ramblings). PC monitors, on the other hand, have been much slower on the uptake. 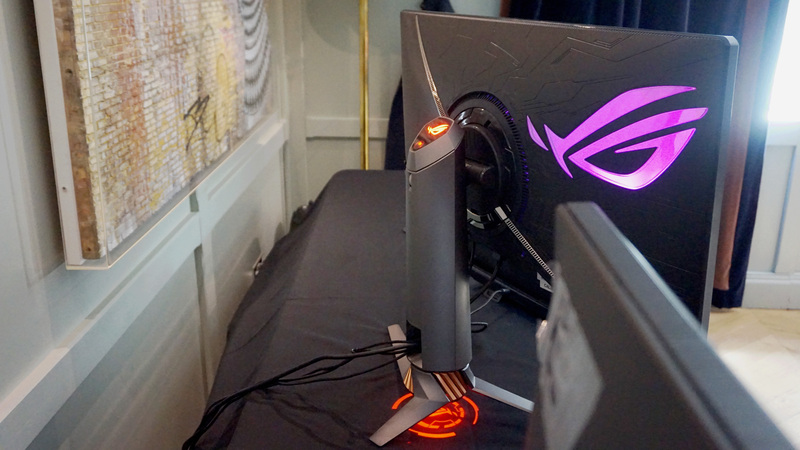 Now, however, Nvidia have finally got their butts in gear and are about to release two of their long-awaited G-Sync HDR monitors: the Acer Predator X27 and the Asus ROG Swift PG27UQ. I went to see them earlier this week and I’m happy to report that they’re both bloody amazing. HDR on PC is finally here.Until now, anything else I’ve seen has been underwhelming. There was a flurry of excitement when Nvidia announced their very first crop of proper HDR monitors back in January 2017 (which included the X27 and PG27UQ), but then it all went a bit quiet. I got hold of BenQ’s EL2870U, which while not majorly expensive was a bit disappointing, and even when Alec tried his luck with the much fancier BenQ SW320, the amount of faff involved trying to get HDR to play ball with Windows 10 just wasn’t worth the tiny improvement he saw in overall image quality. 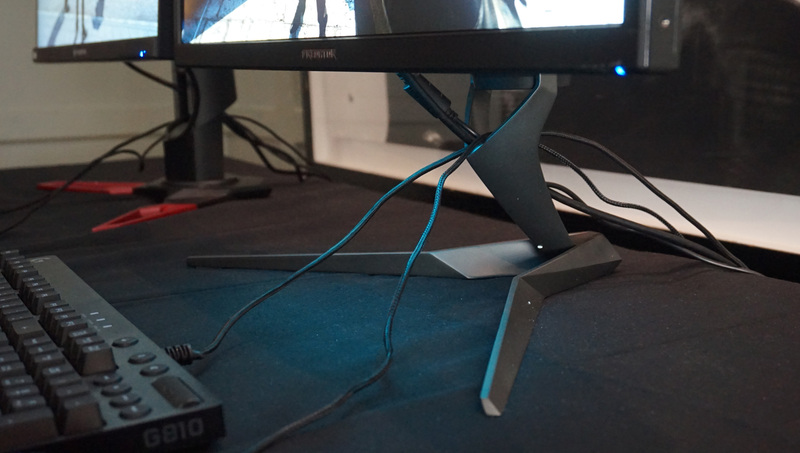 But, on first assessment, the Acer Predator X27 and Asus PG27UQ do very much look like they’ll be both worth the wait and their respective weights in gold – and may even be some of the best gaming monitors ever made. I’ll be upfront: you’ll have to fork out a fair wodge of cash for either monitor when both of them launch over the next four weeks or so. Nvidia wouldn’t be drawn on exact pricing, but admitted that both would cost “at least $1000” each, making them as big an investment as a fancy Ultra HD Premium-certified HDR TV. That’s a lot of money to spend on a 27in display, even if it is 4K, has 384 dynamic backlight zones, 1000cd/m2 of brightness and a 144Hz refresh rate. No matter which way you slice it, we expect $1000 to equate to something much bigger, like all those giant 55in TVs everyone keeps raving about. But if you’ve ever upgraded your TV for a new console (as my husband Matthew and I did recently for the Xbox One X), it’s not too much of a leap to apply the same kind of thinking to a new PC monitor, especially if you’re in the midst of building a new system now that prices for today’s best graphics cards have finally dropped down to something vaguely palatable. Specs-wise, there’s not a lot to choose between them. As much mentioned above, both have 27in panels with 3480×2160 (4K) resolutions, 144Hz refresh rates, and you get the same 384 dynamic backlight zones on each monitor. The latter is particularly key for impactful HDR. The more backlight zones a monitor has, the more proficient it is at showing light and dark bits of an image simultaneously without either affecting the quality or impact of the other, allowing for deeper blacks, brighter, more eye-popping highlights and better contrast than a screen with fewer backlight zones. If that all sounds a bit abstract, think of it like this. You’re playing Final Fantasy XV, and Noctis and his pals find themselves running around Lucis after dark when you see the flashlights on their jackets burst into action. On non-HDR screens (let’s go with ‘standard dynamic range’ or SDR for the sake of acronyms), which are generally ‘edge-lit’ around the sides of the display and only have a maximum brightness of around 300-400cd/m2 if you’re lucky, those flashlights would certainly pack a decent amount of punch, but the surrounding shadows wouldn’t necessarily be as dark as you might expect, perhaps appearing as a slightly murky grey or just looking a bit washed out. With HDR, a maximum peak brightness of 1000cd/m2 and 384 backlight zones at your disposal, however, that same scene becomes transformed – as Nvidia were keen to show me in my demo session. Noctis’ flashlight turned into a veritable beacon of light against the night’s pitch black hue on the Acer Predator X27, and other reflections on shiny road signs morphed from (what people in the imaging biz call) ‘clipped‘ patches of dim milky white into smaller, more refined orbs that shot out of the darkness. No light bleed, no haloing; just eye-searing torch light against the inky midnight sky. Admittedly, I’m not sure what kind of long-term effect all this extreme luminescence will have on my eyes when I eventually get round to testing them, but I’m hoping that because most of the brightest spots are just that – spots – and not the entire screen scorching my face at 1000cd/m2, that it should be pretty much business as usual in terms of how long I can sit at my desk and carry on playing without feeling like I need to go and sit in a dark room for the rest of the afternoon. HDR isn’t just about an increased range of white to black, however, as within that range you’re also looking at significantly more shades of colour, too. As I mentioned briefly yesterday in my post about the upcoming BenQ EX3203R FreeSync 2 monitor, the number of colours (and by extension the amount of luminance, or white to black) you get on an SDR screen is like the long, thin bit of a funnel. HDR, on the other hand, is like the wide, outer rim bit, giving you many, many more colours than you had before. As a result, parts of an image that were once lost to clipping are now almost fully restored in all their lovely detailed glory. This includes small things like being able to see further into those sun flares and reflection spots before everything turns white, and bigger things like the white-hot heat of an Iron Giant’s massive sword – which just looked ‘white’ on the SDR screen, but when viewed in HDR suddenly burned with the same intense shade of bright, fluorescent orange you might see on a toaster filament. It sounds silly, but looking at that sword on the X27 almost gave the impression it was actually giving off its own heat, it was that convincing. Colours generally were more vibrant and vivid on the X27 as well, with the red and yellow decals adorning Noctis’ monster Regalia car appearing much richer than they did on the SDR comparison screen. Again, just as the darker areas might appear washed out on an SDR display, so too do its colours – which is something you’ve probably never thought too much about before because, to your eyes, they still look perfectly fine. But ‘fine’ isn’t good enough for Nvidia, which is why both the Predator X27 and Asus PG27UQ are targeting the DCI-P3 colour gamut instead of the ordinary sRGB gamut. Now, this is something AMD’s FreeSync 2 monitors are going after as well, and it’s also the gamut being used all those high-end TVs, too, in which every certified Ultra HD Premium TV must cover at least 90% of it. Without getting too technical about it and bombarding you with gamut charts and all that jazz, sRGB covers a pretty decent portion of the known visual spectrum – about 35% if you want to put a number on it. It’s the standard that everything’s used up until now, and for the most part, it’s been just that – fine. DCI-P3, on the other hand, covers around 54% of what the human eye can see, and is 25% larger than sRGB – hence that funnel metaphor earlier. Neither Acer or Asus are putting a number on their proposed DCI-P3 gamut coverage at the moment (Acer, in fact, ignores it completely and refers to the in-between Adobe RGB gamut on its website instead), but even without having my calibrator to hand to test it myself, it was clear the X27 was leagues ahead of the adjacent SDR display, offering more life-like colours that elevated my entire gaming experience. Our collective RPS dream (all right, just mine and Alec’s) of seeing Ignis’ delicious foodstuffs realised in all their drool-worthy 4K HDR glory is finally at our fingertips. 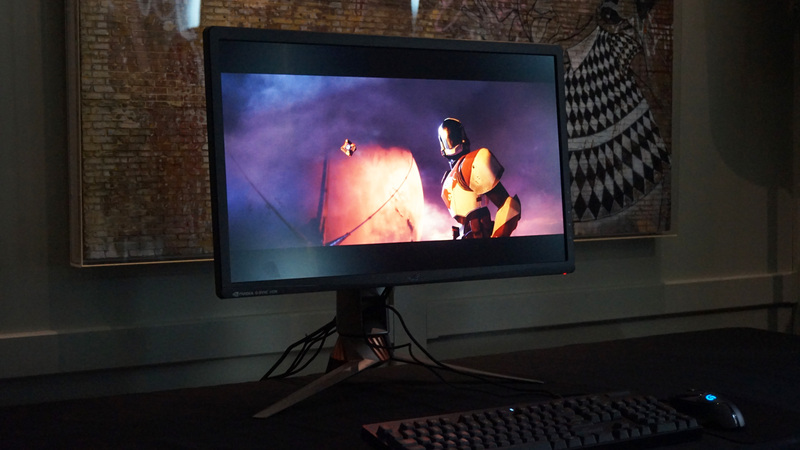 The reason I haven’t talked about the Asus ROG Swift PG27UQ very much is because, out of the two monitors, it was the one running a demo of Destiny 2 sans comparison monitor. Maybe it’s because I don’t know Destiny 2 as well as I know Final Fantasy XV, but here the effect didn’t seem quite as pronounced. Yes, Destiny 2 looked lovely, with all its bright lasers and pew pew guns piercing the alien gloom in a dizzying spectacle of light and colour, but it was hard to tell exactly how lovely it was when I didn’t have an SDR screen next to it to point and laugh at. Taking good pictures of monitors is HARD, okay? 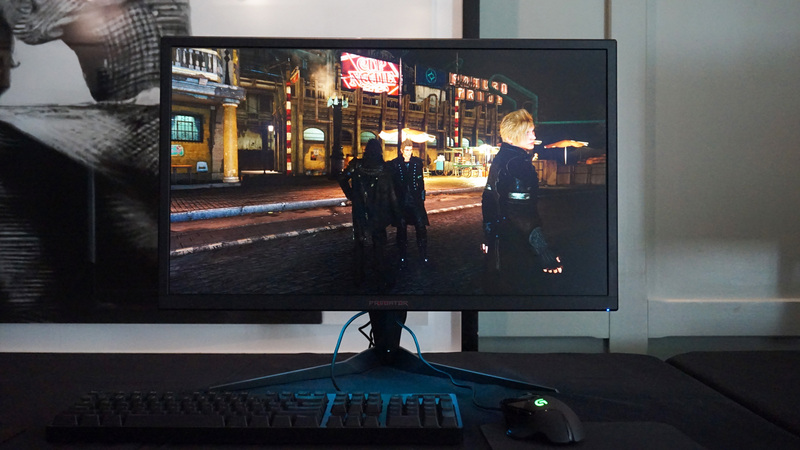 I don’t mean this as a slight on the PG27UQ – I imagine Final Fantasy XV will look just as pretty on that as it does the X27 when I get it in for testing. But it suggests that some games might look better than others in HDR – and when there are currently less than 40 games that actually support HDR on PC, that might not be enough for some to justify dropping over $1000 on a new screen right this second (even if they do come with all the same advantages G-Sync has always brought to PC monitors, such as Nvidia’s variable frame rate tech for smoother, stutter and tear-free gaming and low input lag). Limited game support aside, though, seeing both the X27 and PG27UQ has genuinely made me feel a lot more excited about the rise of PC HDR. So far, one of my key complaints about the other HDR monitors I’ve tested, whether it’s the BenQ EL2870U or even the FreeSync 2-enabled Samsung CHG90, is that their peak brightness is just too low. It lessens HDR’s impact and just doesn’t compare to what you’d get on a high-end TV. Colour accuracy and DCI-P3 coverage alone just isn’t enough to produce worthwhile HDR in my books. Your eyes adapt too quickly to pretty colours onscreen, and after a couple of weeks you’ll probably wonder why you spent such a large amount of money on a monitor that might look a bit better than your old one but not enough that you can really tell the difference. Really, it’s the screen’s brightness that counts in this arena – although having all those dynamic backlight zones certainly helps – which is why the X27 and PG27UQ’s peak measurement of 1000cd/m2 make them such enticing prospects. This is HDR on PC as it should be – Windows 10 faffing be damned. Our console couch friends have been enjoying this kind of HDR for years, so it’s high time us PC peeps had our own version of Ultra HD Premium TVs that we can actually put on our beloved desks – and from what I’ve seen so far, the X27 and PG27UQ look like they’ll deliver just that. Stay tuned for my full reviews over the coming weeks.